Welcome to our short overview of MarketMuse in Acrolinx. For more comprehensive information, visit the MarketMuse documentation. You can use the MarketMuse Add-on in the Acrolinx Sidebar if you have the privilege. If you're not sure if the MarketMuse Add-on is available for you ask your Acrolinx administrator. If you want to know more about assigning privileges see the article on managing user roles and privileges. Note that MarketMuse is only available for Acrolinx Private Cloud. And you'll see the option for Add-ons only if it's enabled. You can start a MarketMuse check from the Acrolinx Sidebar. Before you start a check keep in mind that MarketMuse needs longer texts to analyze the content. If your text is too short there's not much to analyze. Click on the MarketMuse icon to open the MarketMuse tab. To check your content, click CHECK. When the check is started, you'll see a progress bar. 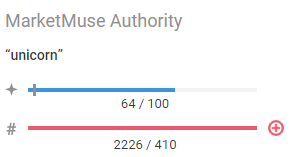 You'll see your Authority Score and Word Count under MarketMuse Authority. For details, you can switch between the related topics and competition tab. Acrolinx also checks your content during a MarketMuse check. Which means you'll see your Acrolinx Score after the check too. You can easily switch between the tabs to optimize your content. You'll spot easily that the results are shown in the MarketMuse colors. Red corresponds with poor or zero while green and blue are the most ideal for good ranking. 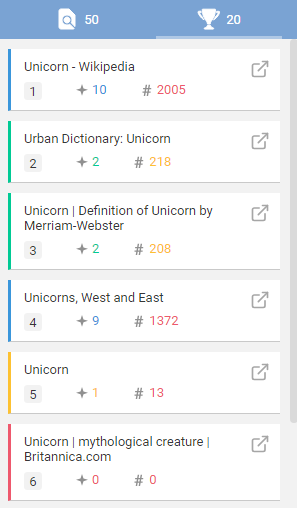 On the very top of your tab you'll see the determined topic and two bars that show the MarketMuse Score and the Word Count. The focus topic MarketMuse found. In this case we checked an article on unicorns. Here you can see your MarketMuse Score. Compare your Score with the MarketMuse Score target, which is indicated by the gray bar. Tells you how many words are used in your content and what the suggested word count is based on your competition. Keep in mind that your article could be longer than suggested, like in our example. In this tab a list of related subtopics that you should cover with your focus topic. We display each topic as single cards. Your mentions You'll see your how often you mentioned related topic within your content. 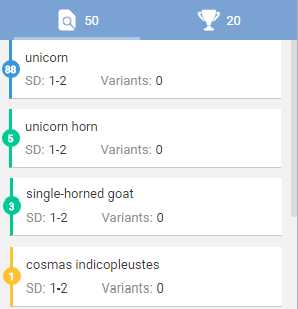 In our example "unicorn" occurred 88 times. Suggested distribution (SD) Tells you how many times you should mention the topic in your content to get the best coverage possible. Variants The number of variants around each topic. The competition tab gives you a look at how your content compares to the top 20 Google ranked content over a specific topic (SERP). From here you can open the related webpages for direct comparison. Rank The Google rank of the competitors content. MarketMuse Score The MarketMuse Score of the competitors content. Word Count The number of words counted. If the focus topic that MarketMuse determined isn't quite what you had in mind while writing you can set a focus topic. So you can choose a specific topic to optimize against. Choose as clearly-defined terms as possible. The number of terms shouldn't be more than 5. Let's say your topic isn't unicorn but Narwahl, the unicorn of the sea. It doesn't matter if you write topic with a capital letter or not, MarketMuse'll find it in your text.